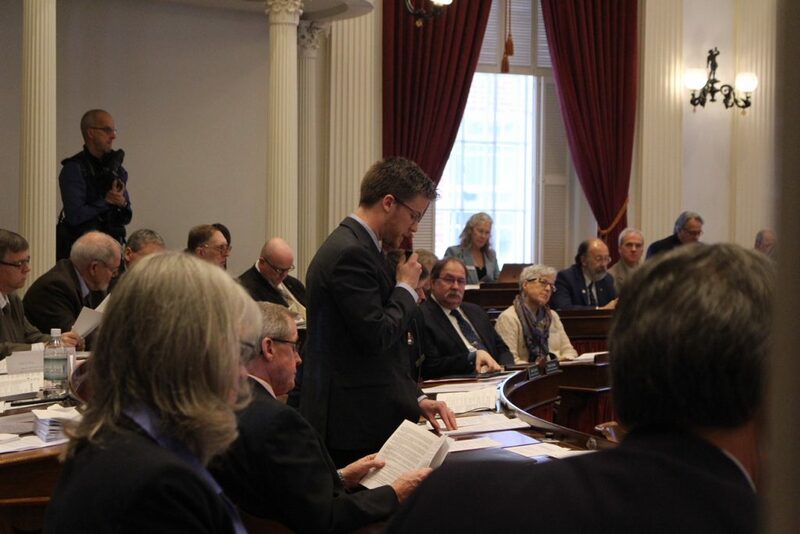 SOCIAL JUSTICE EDUCATION REFORM: Rep. Dylan Giambatista, D-Essex Junction, informs the House chamber about changes to H.3, a bill that will incorporate social justice themes into education for children as young as pre-kindergarten age. MONTPELIER — A bill to introduce social justice education to Vermont preK-12 students was approved unanimously on the House floor Thursday without controversy. The vote followed quickly after the House Education Committee the week before also approved the bill with no resistance. The bill will create a working group consisting of 10 education and state policy members and eight leaders of minority social groups. The group will develop curriculum reform recommendations to present to the State Board of Education, then it will disband on July 1, 2022. The bill also establishes that the Board of Education should collect data on hazing, harassment, and other negative behaviors involving minority groups. According to Giambatista, students as young as preschool age could soon be learning controversial topics such as changing genders and other social justice ideas. Students will also be tested on the social justice curriculum, and the scores will part of Vermont education performance standards. “Subsection G describes the duties of the working group which include revealing standards for student performance adopted by the State Board of Education,” Giambatista said. Rep. Kevin “Coach” Christie, D-Hartford, is a sponsor of H.3 and one of its most adamant supporters. Speaking from the House floor, he told fellow lawmakers that Vermont education will soon cover events and people formerly overlooked in the classroom. “As the working group does its work, they will look at the contributions of all those ethnic groups and social groups that were mentioned, that have been omitted from our education in the past,” he said. A an example of African American history largely missing from the current curriculum, he cited the Tulsa, Oklahoma, race riot of 1921. Giambatista reiterated that his committee gave full bipartisan support for the bill. Other voices from the chamber only promoted the bill. Rep. Anne Donahue, R-Northfield, also praised the bill. Not everyone is convinced that social justice agendas belong in public school classrooms. Jack Bryar, chair of the Grafton School Board, told True North that while he is socially liberal on these matters, having the state push these reforms is more state overreach into education. He said mandating some of these initiatives is similar to efforts on the political right in some states to promote biblical creationism education or anti-LGBT messages. “It’s not the legislature’s place to insert themselves into telling schools how to teach these subjects in a detailed way,” he said. There was no push back? That is troubling. The public schools have enough to do. Leave them alone. And let me be clear ….. there needed to be some push back on the formation of yet another “committee” to study something so that NEXT session the legislature can write yet another law based on that study to tell those that educate children how to do it. Much easier to alter its trajectory now. All children should be treated with respect no matter who they are or where they come from and if we need laws to tell us that then we are in serious trouble. This state has studied and studied and studied bullying and mistreatment of kids in schools. This state has passed laws and laws and laws about bullying. The Women’s Commission, on my tenure there, studied bullying ad nauseam to no avail. NOTHING HAS APPARENTLY CHANGED. If you keep doing the same things, you will get the same result. Why isn’t the golden rule — treat others as you would want to be treated — sufficient? What happened to Rev. King’s admonition to judge by the content of character, not by skin color? See link below — Sen Booker’s inquisition of a judical nominee who just won’t get her mind right. Why do kids not only have to treat other kids kindly, but also accept LGBQWERTY is the norm? The numbers of kids identifying as something they biologically are not is exploding. It’s child abuse. So just talking with a friend of mine who has a student in Jr. High at Harwood Union…. The class is called Global Studies. They have them do reports on revolutions, French, Cuban or Indian…take your pick. They provide all the information sources. Talking about how rich white people were going to ruin Cuba with capitalism, so Castro saved the day…. (rough synopsis). Making a picture of a woman in a hajib, talking about how great it is that she has the freedom to express her religious beliefs. This is our education system? We’re paying $22,000 per year per student for this garbage? We need to completely, totally gut and revamp our education system. Act 46 is only the beginning of our problems…..
Social justice? If it walks like a duck, quacks like a duck, and looks like a duck,guess what? It’s called BRAIN WASHING!!!!!!!!!!!!!! Let’s be honest for a change. Right Mike. Another word for it is indoctrination. You better get you mind right, starting in kindergarten. Don’t think for yourself. The fix is in. First, if you tell someone to find discrimination and racism, he will find it. Second, assuming for the sake of argument there have been incidents of bullying, whatever, against individuals of the protected groups, and I don’t doubt isolated incidents may be found, then discipline the offender, not everyone. Any incidents are just an excuse to impose an ideology they could not get away with. Bullying among kids is hardly a new phenomenon. Third, if you encourage victimhood, more kids will become victims, meaning they will be blameless of everything and responsible for nothing. Hardly a valuable lesson to lead a successful life. Fourth, this state is getting whackier by the day. The sooner my family can get out of this state the better. “According to Giambatista, students as young as preschool age could soon be learning controversial topics such as changing genders and other social justice ideas.” These people are twisted. Sick. Twisted. a preschooler doesn’t even know what a gender is…and more important, doesn’t care. Do NOT let these horrid, horrid people teach your child!!! They are warped. They are evil; they go against God. REJECT THESE PEOPLE & THEIR TWISTED IDEAS! Can there be a more important issue that demands what Rob Roper characterized as the Moral Imperative for School Choice? That point needs to be made repeatedly, Jay. But do you think the people who made up this a$$ of a law would let anyone escape from their indoctrination camps? Let’s be honest with the folks, this is pure and simple brain washing. What will they come up with next? The Marxist ideology advocates for controlling the young minds of successive generations, thus ingraining the ideas of communism/socialism. What is astounding to me is the unanimous vote, which suggests to me that it must be working. If the state want’s to legalize “Revisionist History” it should allow transfer of students to private schools at the same time. Between this and the gender being questioned of k-18 yo’s and the rest of the leftist agenda for the chitleren (who make it from the womb), the guberment has over stepped their bounds in trying to create little caricatures of themselves. If I still has kids i’d be totally ripped about this. But after living under leftist rule the last 5 decades i’ve become numbed. By definition “social justice” has to be different than “justice”. Take your pick Vermonters. Enid, there is only justice. Any modifier, e.g social environmental, racial, except maybe “criminal” or “civil”, negates the meaning of the word. what they ” Need ” to succeed should be ” Rule One “….. Not your agenda. professional who is ” Tainting Our Children ” minds !!. Disgusting. So the legislature thinks that “social justice education” is needed. Regardless of what the parents think ? I am so glad my child is well past high school. More nanny state oversight. The VT legislature is overloaded with Prems and Rinos. To me: social justice education = political indoctrination. Social Justice propaganda is the basis or socialism and communism. Social Justice education is particularly cruel, it takes away peoples hope, doesn’t prepare them in how to over come life’s inevitable struggles regardless of who you are. Social Justice is about group identification, where our civics education is about the person, our country is based upon the rights of the smallest group, the individual, regardless of any orientation or history. Social justice is all about the promotion of envy, greed and misery. It only looks at those who have something more than you, it never looks at those who have less. Our current minimum wage is 97.6% higher than all incomes across the planet. How can you not be grateful? Social Justice is part of the systematic tear down of our great Republic. The greatest part about the United States, is that it’s inclusive to all those citizens. Our constitution protects the rights of one person, against the entire population. It protects one persons freedom of speech. It protects one persons right to bear arms. It protects one person from illegal search and seizure. We should not allow any of this propaganda to be taught in any tax payer funded school, we are not the Soviet Union, Venezuela. I suspect these courses are leading to despair and suicide in our state, it totally undermines hope for the individual. Pure garbage. This is indoctrination, not education, we’ve lost our way. Here is an interview from our neighbors, Mainely Unspoken. This is one of the best interviews I’ve ever seen about our education system. This woman KNOWS what is going on. Fascinating…..best hour of tv out there. Everyone should watch this video. It is really sad what our education has become. School choice and home schooling is much needed in Vermont. The public schools are brainwashing our children, and many of the new teachers even with all there degrees are already brainwashed. Thanks for this one, Neil. Charlotte has been one of my all time heroes. This needs viewing by every single school board in Vermont, in fact in the USA. Amazingly enough, these videos – and there are more– are still available on youtube. So well said, Neil. Help me out. If the US is such a racist country and hostile to minorities, why do tens of thousands of non-Caucasions — Asians, Arabs, Hispanics, Africans — immigrating here each year, and why do millions more want to? My brain is too small to understand that conundrum. Christie needs to look more closely at the history of the events in Tulsa; the 65 armed blacks that started the carnage by killing 10 whites kicked off the riots. It certainly didn’t end the way they envisioned, did it ‘coach’?